Several years after the global slump, the construction industry and many countries and sectors with construction-related activities and firms tied to them still feel the impact of that financial and economic crisis. In contrast, several years prior to the crisis, there had been a major construction bubble. 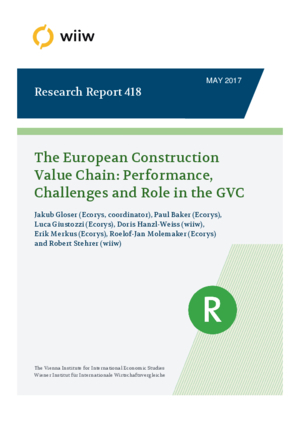 This report outlines the significance of the construction sector for the EU economy, given its potential in job creation in micro and small enterprises as well as its role as a major consumer of intermediate products and related services. Developments within the industry have wide-reaching implications for the nature of growth that can be achieved, not least in terms of achieving the ambition of smart, sustainable and inclusive growth that is at the heart of the Europe 2020 strategy. Furthermore, a modernisation of the sector and improvements in the efficiency of building construction are also key aspects for the transformation of the EU’s energy system as pointed out in the ‘Energy Roadmap 2050’. In this context, the Commission introduced its ‘Strategy for the sustainable competitiveness of the construction sector and its enterprises’ that contained a proposed Action Plan Construction 2020 aimed at addressing challenges within the 2020 time horizon. This Action Plan focuses on five thematic priorities which aim to address economic, skills, environmental, regulatory, and international challenges. This study provides an assessment of the role and dynamics of the construction industry in the European Union and its interlinkages with other industries over the last fifteen years. The report draws a picture of a sector in transformation, partly still suffering from the ramifications of the global crisis, and points to the new foundations from which the sector and the whole value chain can develop towards the future.